Following the tradition set in 2013, on or around October 1 (“The UN International Day of Older Persons”) longevity research activists from around the world organize events and promotions as a part of the “Longevity Day” Campaign. Further events take place throughout the entire month of October forming Longevity Month. All events focus on support of biomedical research into aging to improve healthy longevity for the global population. Within this tradition, hundreds of events and promotions have been organized by longevity research activists around the world: in 2013 events and promotions were organized in over 30 countries, in 2014 in over 20 countries, in 2015 in over 40 countries (the record), and in 2016 in over 20 countries. This year the campaign has also been far researching and encouraging. This has been a great opportunity to organize an online or live meeting in one’s area to strengthen the longevity advocacy community or organize a special publication or promotion (in different languages) to increase the awareness of the longevity cause. With a sufficient joint demonstration of support, we will be able to draw the attention and sympathy of the “mainstream” public and decision makers. In Israel, as a part of this year’s “Longevity Month” campaign, a conference was held on October 15, in Bar Ilan University, including presentations on longevity science by leading Israeli researchers and a prize competition for young longevity scientists, with promotions in the media. On October 16th – 19th, there took place the conference «Molecular aspects of aging and longevity» in Athens, Greece. In Brussels, the Healthy Life Extension Society (HEALES) held a “Longevity meal”! On Friday, September 29th at 7.30 PM CEST, at the restaurant Anarkali 31 rue de la longue vie (Long life street! ), 1050 Bruxelles. During the Longevity Month, local longevity researchers and activists started Biology of Aging seminar series. Yearly, Moscow holds the national conference – “Society for All Ages” exploring all the aspects of life of the older generation. The conference is a meeting platform of world class experts from the entire country. Also, as for 20 years, the yearly conference “Older Patient – the Quality of Life” was held in Moscow on October 2-3. The seminar “Improving healthy longevity” was held on Friday, October 27, 2017, 4-6pm at Allen Avenue, Ikeja, Lagos, also including a video conference. 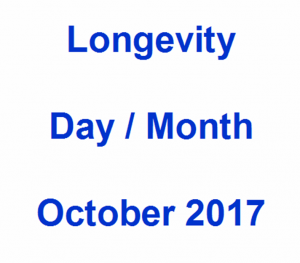 As the organizers stated: “October 1st is International Longevity Day. Recently, we have seen some major breakthroughs with the anti-aging qualities of metformin and methylene blue. Our understanding of biology and the aging process continues. Medicine is evolving from a discovery process into an information technology. Join us on our trip to Jingshan Park, East Gate this Sunday at 10 AM to celebrate the progress we have made, and look forward to the day when we defeat aging and death. October 1st is also China National Day. May China, a country which has long prized longevity, be blessed with scientific progress towards achieving radical human longevity and negligible senescence. As for several years, the conference of Vanguard Scientific Instruments in Management (VSIM) in Ravda, Bulgaria, included a section on longevity and future technologies, with a subsequent promotion during the International Longevity Month campaign. The Senior Citizens Organization of Cyprus held the 8th South Regional Conference (Spain – Malta – Italy – Greece – Cyprus) which took place in Lefkosia (Nicosia), Cyprus on the 14th of October 2017 at 10:00 hr at the University of Cyprus, Nicosia. This conference was considered a part of the Longevity Month. A Longevity Day was celebrated in Cosenza on October 1, by Senior Expo Italia. More details about the various events and promotions can be found at the Longevity Day / Month facebook page. It is never too early to organize events already for the next year’s campaign. 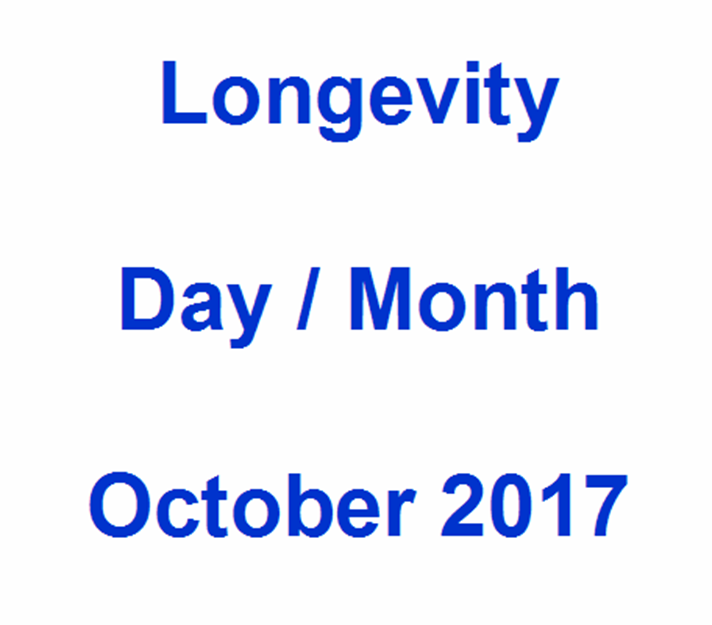 If you organize or plan to organize an event or promotion for the next year’s Longevity Day / Month campaign, please let know. As in each year, we will create a joint register of events and publications of this campaign and promote them all together – to increase the global outreach and impact of the campaign. You are welcome to contact me directly. Thanks! Here are some more examples of events and promotions from the past years organized by longevity research activists around the world in the framework of the “Longevity Day / Longevity Month” campaign.